Lately, I’ve been doing a lot of VFX work with Alexa Log-C footage. Compositing with Log footage generally requires a Viewer LUT so you can actually see what you’re doing. I don’t like using LUT files because they’re fixed color transformations and usually need to be supplemented with additional color tools on a per-shot basis. While I was working, I found myself repeatedly creating the same “custom viewer LUT” setup, so I decided to make it a dedicated tool called QuickGrade. Contrast: Obviously. It’s built to be flat. Exposure: After yanking on the contrast, it usually needs an exposure adjustment. Saturation: It’s not inherently overly desaturated, but it benefits from a boost. Green-cast: Alexa Log-C footage typically needs a healthy amount of “de-greening”. For added flexibility, I also included controls for White Balance, Black Point, and White Point. The controls in the top half of the node are for luminance, and the bottom half for color. Quick and simple. 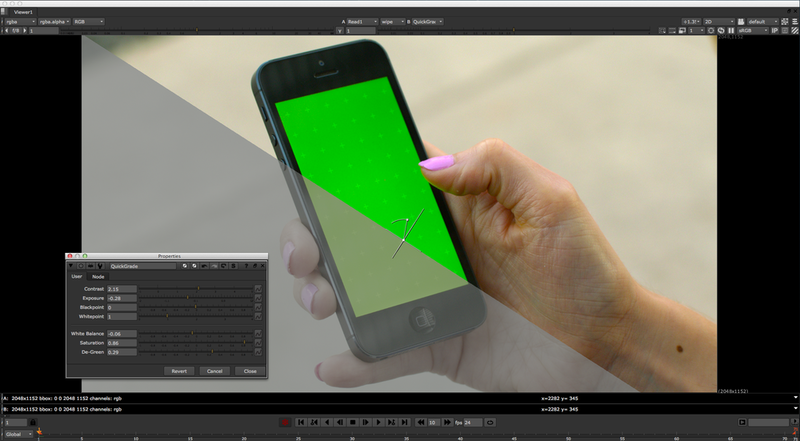 Typically, I drop this node into the Node Graph above the Read node, unconnected, and set it as the Viewer Input Process , but it works just as well when used like any other color correction tool. QuickGrade used as an Input Process. QuickGrade is a ToolSet for Nuke, not a Gizmo. ToolSets are easier to install than Gizmos, they show up in your toolbar without needing to write any Python code, and they’re easier to modify later if you feel the need. Since the whole idea behind creating this tool was ease of use and speed, the easy, lazy, ToolSet won out over the less easy Gizmo. To install a Toolset in Nuke, just navigate to your .nuke directory. In there will be a folder called ToolSets. Unzip the QuickGrade.nk file, drop it inside, and you’re done. Okay, so I changed my mind about the whole Gizmo thing. Gizmos, unlike ToolSets, automatically open their properties panes when added to the node graph, which is great. So, now you can choose from either option below.